Keeping the kids happy is an important part of any family holiday. But a new study suggests that 'pester power' is causing many families to blow their holiday spending budget on treats and other extras. One in five parents now allows their youngsters to choose their holiday destination, with 45% booking beach breaks at the request of their offspring. Some 43% said their children persuaded them to dine in fast-food restaurants on holiday, while 60% said they visited theme or water parks to keep their little ones amused. 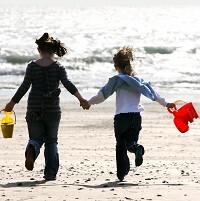 More than one in five (24%) said they took one of their children's friends on holiday to give them someone to play with. According to the survey, paying for all these extras could wipe out the benefit of bargain breaks in top destinations such as Bulgaria, Spain, Portugal and Greece. The poll found families set aside an average of £669 to cover their holiday spending but most go over budget by around £72, making it even more important for families to save on essentials such as travel insurance before they jet off on holiday. According to the study by Post Office Travel Money, Bulgaria could be the best destination for those looking to save cash on their family holiday. Researchers looked at the cost of 12 items such as food, drinks and ice creams. The items cost just £76 at Bulgaria's Sunny Beach, compared with £176 at the most expensive resort, Sorrento in Italy. Perhaps surprisingly, Bournemouth was one of the most expensive destinations, with the items costing a total of £139. But in another survey, it was found to have the cheapest water park prices at Splashdown Poole. Andrew Brown, of Post Office Travel Money, said strong competition for business had driven down prices in many holiday resorts. "However, pester power can soon empty the family purse so we recommend that holidaymakers set a budget for kids' items and stick to it," he added.